When we first learnt to measure, we were taught to convert the length into a number of measurement units. We then had to remember or note down the measurement units to then reconvert the number of measurement units to the original length. In order to do this we needed light at the measuring site and on the workpiece, as well as access in order to keep the eye at a suitable reading distance and at the right angle from the measurement points. The tools needed were some sort of scale and a pen or the like to mark out the measured length by hand. The above analysis of the old measurement method demonstrates that it takes along time to learn, is complicated and produces unreliable results. 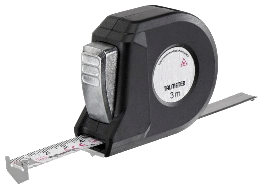 Using markingmeasure the length between the combined marking and measurement edges is set in the same way as on Vernier callipers. The length is locked and then transferred to the workpiece using the marking edges to scribe out the set length. The extender, with its combined marking and measuring edge, makes the TALMETER a universal measuring instrument that can effortlessly measure inside and outside measurements. The black figures show the measurement from the measuring-edge of the blade to the indicator. The red figures show the measurement taken with the extender folded out (generally an internal measurement). The blade is normally locked and if it needs to be extended the release button must be held in. By pressing the button a little, the brake on the blade is applied so that it is bot retracted by the spring, however you can push it in. Pressing the button to its bottom position releases the blade completely and it is then retracted by the return spring. The 6.1m Talmeter has a three-stage control button. Return position. The blade rewounds by the return spring. Sliding position. The blade is curbed so that it cannot be rewound by the return spring, but can be pulled out or pushed in for measuring. Locked position. The blade is locked. Fold out the extender for taking internal measurements. When reading internal measurements, use the RED figures. Fold away the extender when not in use! The EEC II grading on the blade means that the graduation error in accordance with these norms should be within the tolerance zones stated in the table alongside. Place the combined marking and measuring edges over the measuring points at the workpiece to be measured, in the same way as if you would use a slide-caliper, or set the length at the scale against the indicator, then lock the blade. Use the marking edges to mark off the set length on the workpiece. Pull out the blade released (return position) and hook it over one edge of the work piece. Pull the measuring edge of the casing to the other side of the workpiece then lock the blade. Pull the blade out slightly further than the actual internal measurement. Press in the release button to the sliding position and move the Talmeter sideways until you consider that the shortest measurement has been reached - then lock the blade. Talmeter (2.1m & 3.1m) has a special scale for direct diameter read off when measuring the circumference as shown alongside. The diameter measurement is read off from the diameter scale on the lower turn in the middle of the 10/20cm lines on the upper turn. 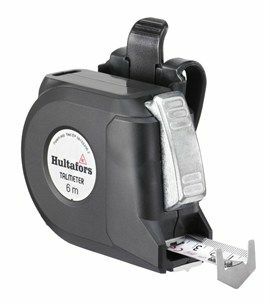 With a Talmeter 3.1m you can accurately measure cylinders without a free end from 30mm up to 925mm in diameter and up to 607mm with a Talmeter 2.1m. Set the radius against the indicator of the scale. Lock the blade. Circles can be drawn by using the measuring edge of either the casing or the blade as a central pivot. All Talmeter measures now in stock at shop4fasteners.co.uk - an official distributor for Talmeter measures. Order securely online and with confidence today. Your first stop shop for fasteners, fixings, tools and more.